Monday - I completed a 6 mile bike ride on Monday. I would normally do 10 miles, however, I do like a chat and happened to cycle past a mum from my daughter's class walking her dog. She was moving that week and likes a good moan about the school just like me. So that cut it short by 30 mins and I realised I still needed to clean the house etc. Tuesday - I did my 30 minute weights DVD which was probably tougher than the bike ride if truth be told. Wednesday - 45 minutes of Wii dance with wrist weights as it was too wet outside - wasn't half as good a workout as my bike riding but it still counts. Thursday - nowt. I didn't feel like it. Oh the shame. The Shame. Friday - still didn't feel like exercising but forced myself and did 35 minutes of the Wii Dance with wrist weights with buddy in tow. He likes to dance with me. Saturday - 5 mile bike ride with my son. It was a bit slow as he's out of practice but better than nothing I wager. Sunday - I plan on another bike ride if dry tomorrow. So I had one fail when it came to the exercise front on my 2 week challenge to wear my Zaggorra gear. Not too bad. I logged my food intake most days on my fitness pal. I haven't on here as I don't want to repeat everything. The one thing I don't like about my fitness pal is that when you do exercise it says you can eat what you burnt off. Surely that defeats the object? I try not to eat into the exercise calories but sometimes I have to, as after I've entered some foods, I think crikey I only have 200 cals left for dinner! My recommended intake is 1200 cals a day. 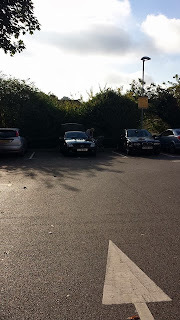 In other tittle tattle, I came across the worse case of Pig Parker whilst doing my weekly shop at Aldi. What do you think? I was actually speechless. Ordinarily I would have contemplated going up and saying do you realise you have taken 2 spaces but I came to the conclusion that the person must be having a breakdown of sorts. There is no other explanation is there? Even the arrow is pointing at her. The lady is merrily unpacking her shopping oblivious to the internal rage of many Aldi shoppers! 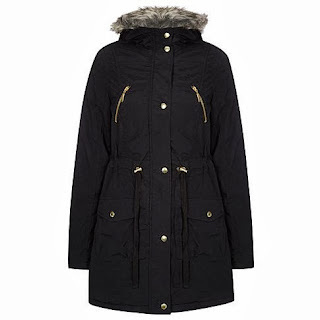 This picture doesn't really do it justice - its in classic parka green and longer at the back - the hood has a fabulous blue and red tartan lining showing. The coat can be pulled in to create the illusion of a waist! Pic George at Asda although I do have one hanging up. In other news, I have to admit to a bit of a love affair with George at Asda recently. I always get the kids school uniform on line and whilst I still buy the kids clothes from NEXT (as its so easy to get it delivered etc) the clothes at George are just as good and half the price. I've even been buying myself a few things. Take this parka - it was only £25.00 and it has tartan lining and a bit of fur. I can now look like every other mum on the school run. No point standing out from the crowd now is there! Finally, I had a little clear out and sold the kids snow boots on ebay and some dressing up costumes. I am officially the world's worst seller on ebay. All my items finished yesterday at some stupid time like 2.45pm. I did get about £20 for my bounty but really I need to think these things through. Finally, my friend (who I interviewed about losing 4 stone in 4 months) writes a blog about her son's rare condition. Check it out here. It certainly has been a busy week for you again! I don't know how you manage to fit the exercise in! That really is some stupendous parking! It was my pleasure to include you in my Fresh Five, you know how much I love your rants! I'm glad that things are working out with the school and I hope it doesn't take you long to make the move to the new school.